In nature, only change is constant. So, embrace the dynamic side of your nature and change your look. try something different. Explore your many shades and hues. After all, Bausch + Lomb Optima Natural Look lenses give you twelve different vibrant colours to choose from. 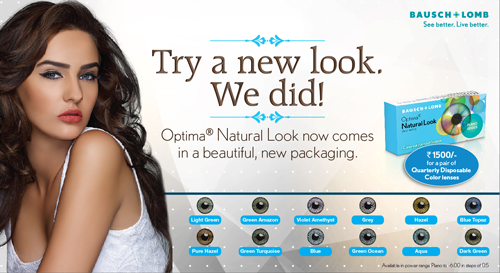 Optima Natural Look, has a design that mimics the iris features more perfectly and offers a more natural look. Optima Natural Look color lenses are designed keeping the highest aesthetic in mind while also providing for the health and care of your eyes. so, go ahead. Try something Natural. Try something New. Cosmetic contact lenses (including those with zero power) require proper fitting by your eye care professional. Follow the contact lens replacement schedule and care instructions recommended by your eye care professional. Reusable cosmetic lenses require daily cleaning, disinfection and storage as recommended by your eye care professional and contact lens manufacturer. Always handle contact lens BEFORE applying or removing facials or eye cosmetics. Do not swap or share contact lenses with anyone. Consult your eye care professional for more details.